In the unspoilt surroundings of the Jura, in 75 acres of wooded parkland surrounded by cliffs and forests, the Domaine de Chalain offers the perfect combination of relaxation, fun and discovery. On the shores of lake Chalain, this lovely site has a wide range of accommodation options - camping pitches (455 with electricity), mobile homes, bungalows or chalets. With a comprehensive range of leisure activities for children and adults, it's a great family option. 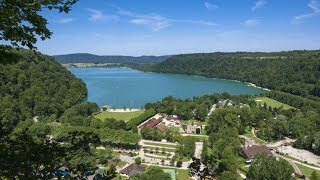 There are swimming opportunities and water sports in the lake or Les Lagons aqua park. Indoors there is a heated paddling pool and swimming pool, together with a wellness area with sauna, jacuzzi (over 18s only) and hammam. Outdoors you'll find another paddling pool and swimming pools with water games, jacuzzi, waterslides, multi-lane slides and waterfalls. The activities on offer are comprehensive and include sports tournaments, gym, aquagym, archery, laser games, kids' workshops and evening entertainment, including discos, films and karaoke. Some activities are even available in the low season, especially at weekends. Such a popular family site, they even offer you a beach lifeguard in July and August. marked walking trails, a tennis court, football pitches, volleyball and basketball courts, play and picnic areas, table tennis, TV rooms (French and foreign channels) and film shows. The following paid activities are also available on the site: treetop adventure course, mini-golf, hire of mountain bikes, canoes and pedalos. The sanitary blocks are well equipped with showers, private washing cubicles and facilities for babies. Additional facilities include The "Le Cottage" restaurant, takeaway, ice-cream vendor, bar, bakery, grocery store, launderette, sports and camping shop which are all located in the heart of the park. At the reception, you will also find all the practical and tourist information you need for your stay, as well as safe hire, Internet terminals, a WiFi hotspot (also available on the campsite for an extra charge) and a cash machine. Doucier is 25 km. east of Lons-le-Saunier. In village turn left off D39, site signed, entrance in 3 km.